Fitting it all in and getting $H!T done. Yes it is true that I always have a heap of things going on at one time, and also a number of plans that are ready to burst toward fruition in the future. Between my husband and I we run 3 business, I also try and keep up with this blog and keep the house clean and tidy. Like many women, I am pretty good at juggling life and getting things done. But I am going to let you in a little secret. I do have a system. I have had a diary/planner since highschool. I have all appointments diarised so I know exactly where I should be on any given day. I also have defined goals that I write down every year, month and week. Science has PROVEN that you need to write down your goals. I have a vision board that details my long term goals and them a physical planner that outlines exactly what I want my life to look like in one year. I do this around my birthday. It is like giving myself the present of and elite life. I look at every area of my life and set a goal to achieve within that year. Once I have set my (often big stretch) goals, it is easy to chunk them done to monthly goals and then further to weekly and sometimes even daily tasks. 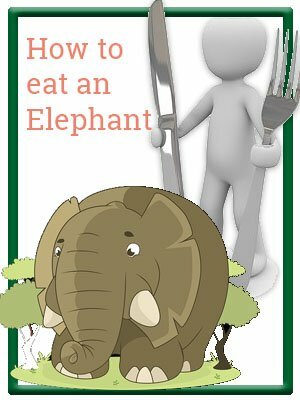 The old adage of “how to eat an elephant – one bite at a time” is fitting. Yay!!! It is here. 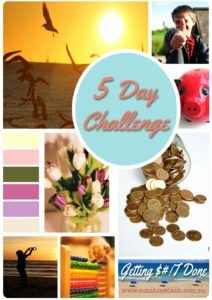 Please check out my 5 Day Challenge for Getting $#!T done.